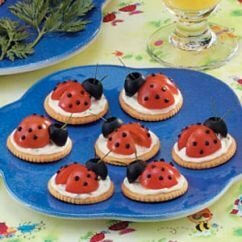 Take a look at these ladybug appetizers! Wouldn't they be fun to make and serve. This is just one of several fun food creations offered in Bugtastic Party Foods: A Recipe For Fun! Snoopygirl also shares recipes and directions for Dirt & Bug Cake, Wormy Cheese Dip, Spiderific Cracker Sandwiches, Bug Juice, Squirmy Cupcakes and more! Recipes and design instructions are included in this fabulous article! Your kids and friends eyes will be bugging out over these wonderful creations. Note: The original site for this article has closed. However, you can still find the Ladybug Appetizers Recipe on TasteofHome.com. Image Credit: Ladybug Appetizer photo from article below.